A few days ago I received an anonymous letter in a Southern California Edison company envelope. It concerned the behavior of a manager in the control and electrical design engineering department at San Onofre Nuclear Generating Station (SONGS). The letter alleged "Ethical Misconduct" and was apparently sent to San Onofre's Chief Nuclear Officer and Senior Vice President, Ross Ridenoure, on Christmas Day, 2009. The letter also described a "fear of retaliation" simply for complaining. Rightly or wrongly, the industry previously considered the pair of reactors at San Onofre to be among the best-operated in the world. The workers took pride in their "culture of safety." Now, San Onofre is near the bottom in the industry's own self-ranking, and is under special scrutiny by the Nuclear Regulatory Commission (NRC). And despite that scrutiny -- or perhaps in part because of it -- things are actually getting worse at the site. Extra inspections and mass firings have served only to increase the desire of the plant workers to hide their mistakes. But what are they covering up? These are just the things we've eventually heard about. Undoubtedly there are many more problems. The anonymous letter described an incident where a manager, Mr. Rak, deleted a survey from one of his employees' email, thus preventing the employee from returning a possibly-unfavorable evaluation of the manager. The survey was being conducted to fulfill NRC requirements to show that the plant was addressing their "culture of cover-up." Certainly one of the easiest ways to introduce a statistical bias into a survey's results is: Don't let people take part in the survey if they might not answer questions the way you'd like. And this apparently happened over what the employee described as a "minor altercation." What about when things go really bad? What cover-ups occur then? As it turns out, the answer to that question at San Onofre is also known, because of what's happened to people like Rick Busnardo: Employees who try to break through the "culture of cover-up" are denied access to email (they must put all their complaints in hand-written notes). They are also prevented from talking to their own supervisors -- sometimes for months at a time. And they -- or the departments they supervise -- are issued "Stop Work Orders" (SWOs) for no reason. Furthermore, the official wording of any complaints that do get into the system are based on the upper-level manager's idea of how the complaint should be worded, NOT the wording of the actual complainant. So if a line manager writes that one of his employees knowingly and intentionally violated procedures, executive management can instead -- without any facts to back up their version -- describe the incident by saying that the line manager was unable to properly supervise his employees. In the past year, I've seen or met, or received letters, phone calls, or emails, from about half a dozen San Onofre whistleblowers. This level of activity is astounding and unprecedented. It's very hard for an outsider to know what's really happening at the plant. Secrecy is firmly embedded in the culture of nuclear energy, regardless of whether there's also a "culture of safety" at the same time. It can -- and should -- be argued that the two cultures are incompatible, and ONLY in a culture of openness can there be any hope of a culture of safety. While recognition of the "culture of cover-up" by the NRC and San Onofre employees is new, the culture itself is not new. For example, in Spring, 2001, San Onofre employees dropped an 80,000 lb crane they were hoisting. The NRC put a slew of lawyers on the phone with me, trying -- unsuccessfully -- to get me to reveal the name of the employee who told me about the incident! The openness the NRC wants does NOT extend to the public. Later, when I complained about numerous instances of the P.R. spokesperson for the plant lying to the media and to the public, I was told by the NRC that statements made by the public affairs officer of an NRC-licensed facility are not "regulated activities" and their veracity will NOT be investigated. But the media will report what these P.R. spokespeople say as if they are speaking the gospel, in part because the NRC won't correct even the most blatant lies. Nuclear power is not cheap, it's not carbon-free, and it's not safe. The waste problem is intractable. A meltdown, which can contaminate an area the size of Pennsylvania, can occur at any moment, at any plant. Huge amounts of money are spent in back-door ways to keep nuclear power plants operating. Huge amounts of water and other natural resources are wasted every day, and huge amounts of coal and oil are burned to mine and mill the fuel that is used in nuclear power plants. Just look at the clean-up bills for our weapons sites, such as Hanford, Washington, to get an idea of what the real clean-up costs for nuclear power plants (which create even MORE waste than our military programs) will be. There is no reason to keep San Onofre open any longer, and many good reasons to shut it down forever -- including the 500 NEW pounds of high-level nuclear waste it creates every day it remains operational. Safer alternatives exist, which can provide enough jobs for every skilled and honest worker currently employed at the plant. 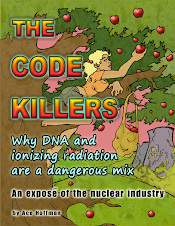 The author has been writing about nuclear issues for several decades and is the author of THE CODE KILLERS, an expose of the nuclear industry, available as a free download from the author's web site. He is also an educational software developer.